J and I were back at The Quays theatre at The Lowry. This time, it was to watch Fauna. J was excited even before the show started because we were in Tier 1 seats. He was perched on top of a tall chair and had an unobstructed view of the stage and everyone seated in the stalls. Fauna opened with bird song. Six skilled performers then took to the stage. One of them took up the guitar and keyboard that sat in a corner. He went on to provide the live score for the show, while the other five performed breath-taking stunts in time to the music. J and I were mesmerised and petrified in equal measures as we watched five talented artists defy the very structure of the human body. They contorted and glided seamlessly from one move into the next. The skilful control and masterful isolation of individual muscle groups was simply spell-binding. Through the movement, Fauna took us on a journey of exploration, of trying to find similarities and differences between humans and animals. Each act told a story and each performer played to their strengths as they portrayed animal traits. A trapeze and a set of upright balance rods were used to weave details into the narrative. From alpha males locking horns to females fighting for pride of place, it wasn’t difficult to see how, if you take away the influence of the cerebral cortex, humans and animals display essentially the same base behaviour. 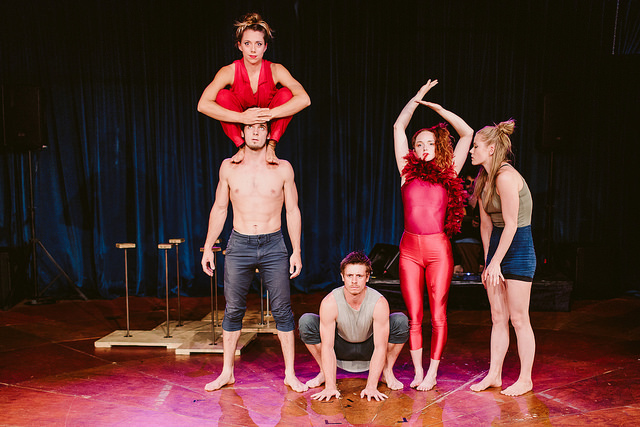 Along with the obvious athleticism and energy on display, the performers used facial expressions, and on occasion, a touch of humour, to enhance the story-telling. This appealed enormously to the younger members in the audience. There were elements of Fauna that had adult overtones, but the artistry and imagery make it an entertaining family show. One that I will be happy to watch again.